At hearing this, a sudden weakness came over me, which Ryan must have noticed, because his tone changed. I took a step back from him, mounted my bike, and bolted away from there, producing hellish noise for no better reason than to drown his advice, but to my dismay it went on rattling, rattling, rattling inside me. I rode for a long while and when at last I came back to my quarters, surprise! There was an envelope on my pillow, and it was from my father. My first thought was that by arriving here, this letter served to prove a point. It showed me that I was reachable. If you wanted to contact me, you could, which meant for some reason, Natasha didn’t. She must have stopped caring for me. What else could explain the silence of my muse? Lenny my son, I wish I could go on keeping this from you, but at this point I can no longer do it. I’m in pain, severe pain, and it’s been wrecking me for the past three months. You know me, I’ve always resisted—perhaps too stubbornly—to set an appointment with my doctor, because despite being a learned man, he can never help, and all he does, in my opinion, is rely on the wisdom of ignorants and prescribe drugs for them, drugs for which the unintended side effects are worse than the disease they’re supposed to cure. At last the pain became unbearable, so I dragged myself, somehow, to his office, and after a long series of exams I finally got a diagnosis, and Lenny, it’s not good. I know you’re doing your duty there, and for that I’m proud of you, son. Thinking of you I read the paper every day, but find myself too tired to cut clippings out of it and send them to you, which may seem to be a simple task, but for me, it’s daunting. Besides, there’s no real need for these clippings, is there, because you are right there, in the thick of things. From listening to the radio I’ve learned a lot about the war. The Germans seek to prevent the buildup of Allied supplies and equipment in the British Isles in preparation for the invasion of occupied Europe. This cause, fighting an evil enemy who threatens to overtake the entire world, is greater than both of us. So the last thing I would want is to take you away from where you are, by asking you to come back home to see me. The words one last time did not appear on the paper, but I knew they must have been weighing on his heart. Perhaps that was why the letter was left unfinished. "What an amazing story! I have heard of Uvi Poznansky, but I had not previously read her work. Wonderful! Her writing is as beautiful and lyrical and sad as the story she lays out, that of a husband trying to reconnect with the love of his life... This is a deep romance and a true love story, as opposed to so much shallow trivia that's labeled romance. 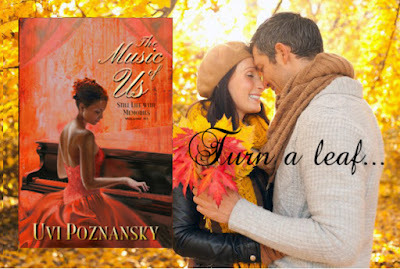 Elegant, classic, and classy, The Music of Us is a top of the line read. "